N&P is now 2 years old! 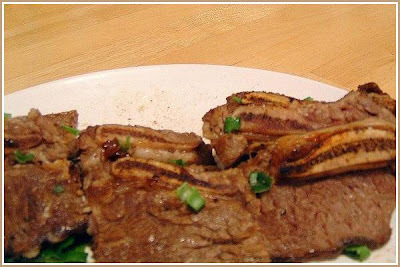 The local store had a special on flanken style short ribs and I thought it was the perfect opportunity to revisit the very first recipe I posted back in 2007, Kalbi, or Korean BBQ. It was also the perfect occasion to use the shiny new indoor grill that I got Steven for Xmas, part of my not-so-secret-anymore ploy to get him to cook for me. I'm hoping I can tap into that innate man and grill bond. 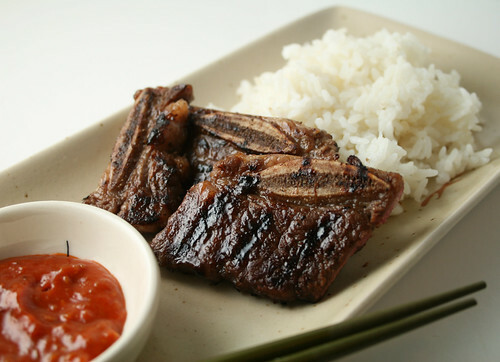 I started making Kalbi not long after my first Korean barbeque restaurant experience. I thought the fact that each table had their own built-in grill was just the coolest thing (what can I say, I'm easily amused). Of course the ventilation system can never keep up with 20 tables simultaneously grilling, so Steven's parents wisely advised me to leave my coat in the car. The whole process of cooking your meal at the table is so much fun and very family/group oriented. If you've never been to a Korean BBQ place, I highly recommend you round up some people and go. Yikes! Can you believe this ancient picture?! At home I would either sear the short ribs on the stove top or broil them in the oven. Back in the college days, when we still had a George Foreman, that worked out pretty well too, albeit a little bacheloresque. Now that we have this new indoor grill, we can get those pretty grill marks. 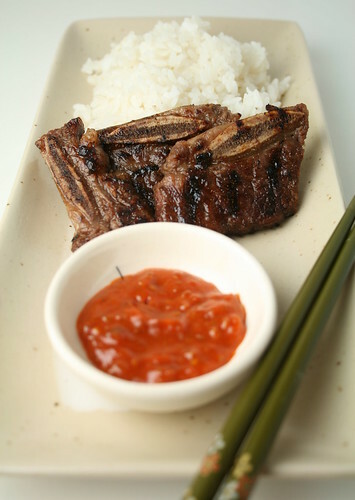 Note: Flanken-style short ribs are ribs that have been cut across the bone. Mix the marinade and pour over ribs in a dish or in a zipperlock bag. Marinate in fridge for 6 hours to preferably overnight. Turn ribs or flip bag once during marinating time. Lightly oil your skillet or grill grate. Sear on medium high heat, broil at 500 deg F on the top rack, or grill the ribs on medium high heat to your desired doneness. I usually like to cook them until no red juices come out of the bones and they have a nice sear, about medium - medium well. Garnish with toasted sesame seeds and serve with ssamjang and rice. If you want you can also include Romaine lettuce leaves or perilla leaves to wrap a bite-size portion of beef and rice with a dollop of sauce. My blog is two years old too, and I am recently going through a redesign. This has forced me to go back to pictures from two years ago. WOW! I have really improved, and it looks like you have too! Isn't it weird...the learning curve on something like food photography! Great photos! The ribs look fantastic! Happy blog birthday! I love going back to my early posts, too, and trying to improve them. Wow!!! Three years. Quite a milestone. Great looking ribs. So hungry looking at the pictures! Congrats on turning 2! I just discovered your blog and I really like the theme here--you don't have to have a monster kitchen with all sorts of gadgets to make great food at home. May you blog have many more birthdays here! Thank you for the recipe and pictures. I am considering buying an indoor grill in large part to make kalbi at home. Does the sanyo indoor grill get hot enough to replicate restaurant style korean bbq?